The Bachelor of Visual Arts is a partnership program with Federation University. This means that students have the opportunity to study at Degree level at NADC, however the program is administered and issued by Federation University. 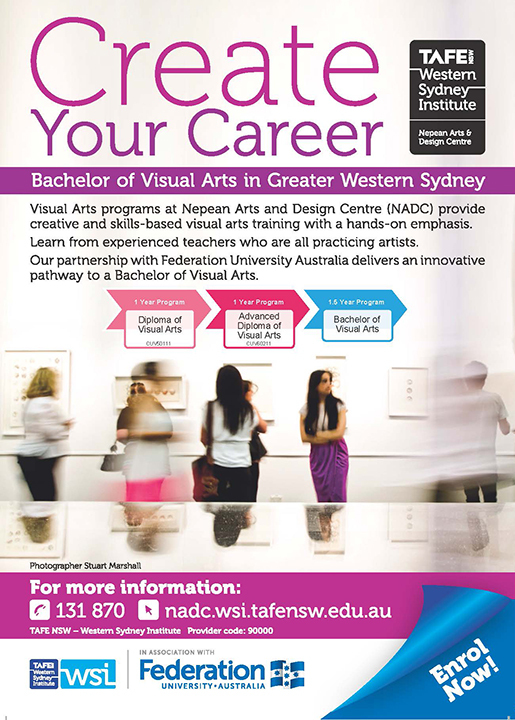 Did you know our Diploma and Advanced Diploma of Visual Arts programs at NADC give you direct entry into the BVA? If you are at the beginning of your post-secondary study in visual arts, then your first step to your degree is to enrol in and complete the Diploma of Visual Arts at NADC and/ or the Advanced Diploma of Visual Arts. Please attend one of our information and enrolment sessions in January to gain entry into the Diploma of Visual Arts, and the Advanced Diploma of Visual Arts. You will need to bring a folio of 6-10 artworks you have made. The info/ enrolment sessions are being held on January 20, and January 27, from 1pm-4pm. Location: Nepean College, Kingswood Campus, in Building P, Ground floor, Room 53. Here's to a creative 2016!